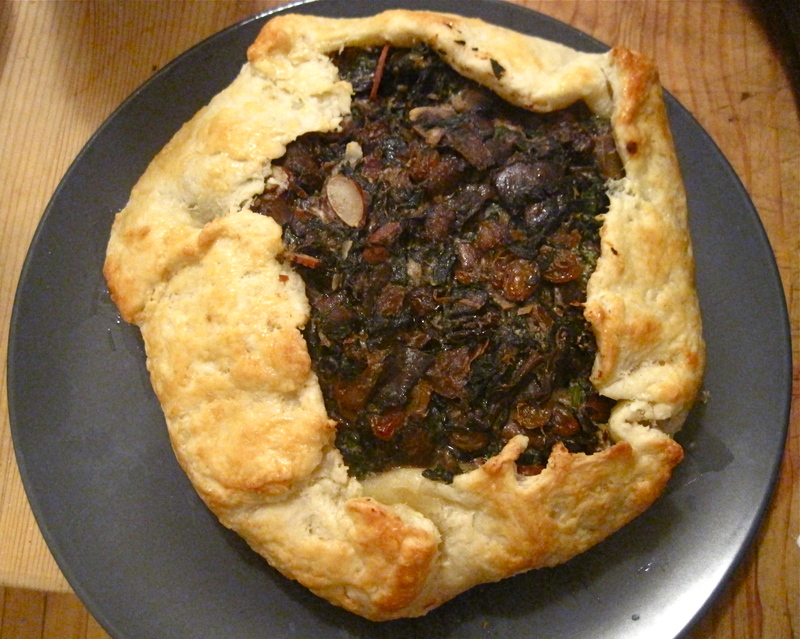 Galette? 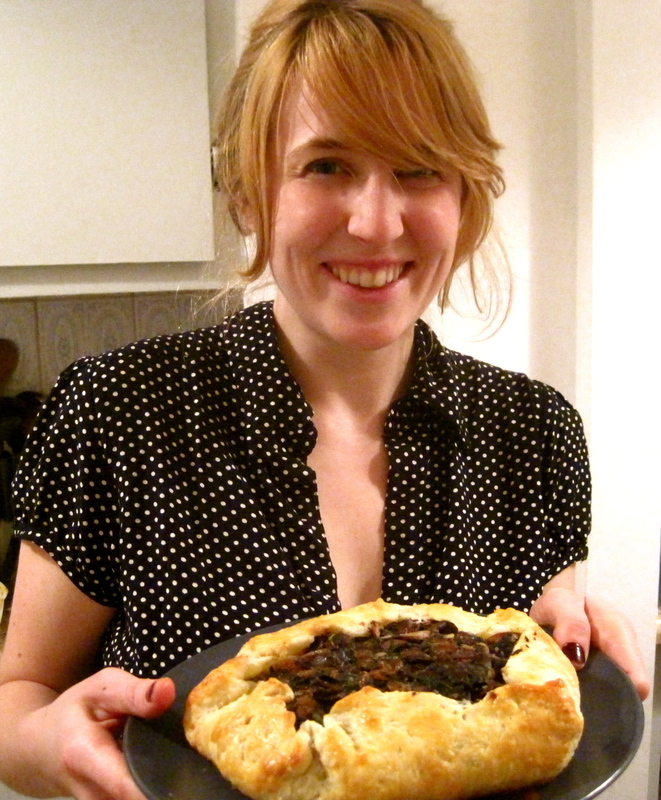 What’s a galette? It sounds fancy in its French-ness (though living in Quebec has pretty much removed the stereotypical romantic allure of French for me–it’s lost somewhere in a vat of poutine and tabernacs) but it’s really just a lazy pie. Instead of cutting out pie base and top crusts, you just roll out pie dough, plop all the fillings in the middle, and fold the edges over the pile to hold it all in. The French-ness of it turns its unkempt appearance into something “rustic,” and it makes an impressive dish for a small dinner party or date night. 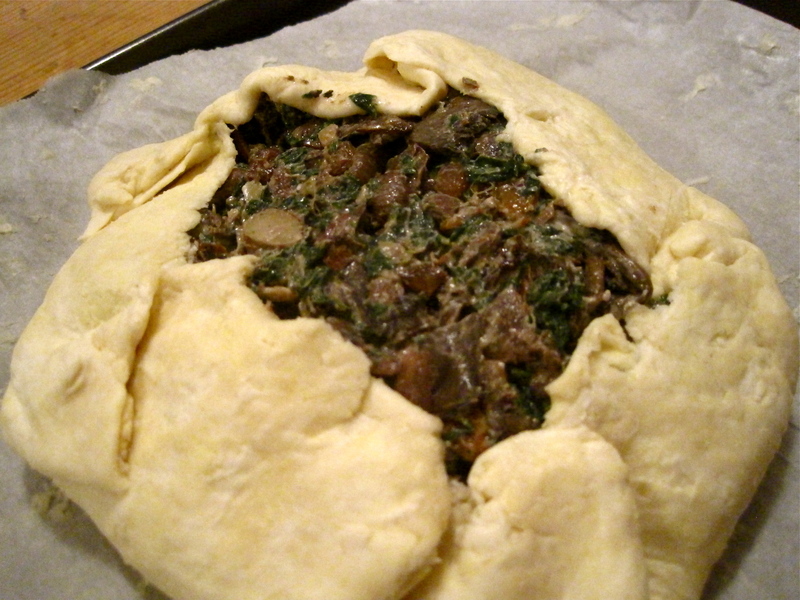 The filling recipe is approximate and there are all different kinds you can make–the only important thing is to cook as much of the liquid out of the filling as you can before assembling your galette so your crust doesn’t get soggy while cooking. Note: The original recipe was very insistent/vigilant on keeping things cold all the time–putting the bowls with the dry ingredients in the fridge for an hour before mixing in the wet, for example. I stuck things in the fridge/freezer when I had the chance, like when I was busy puttering around with other ingredients, but I’ve made it since and I think as long as your butter is cold when you cut it in and you chill the dough for at least an hour before actually rolling it out and assembling your galette (basic steps for any kind of pie dough), you don’t need to worry so much about the other ingredients staying chilled all the time. 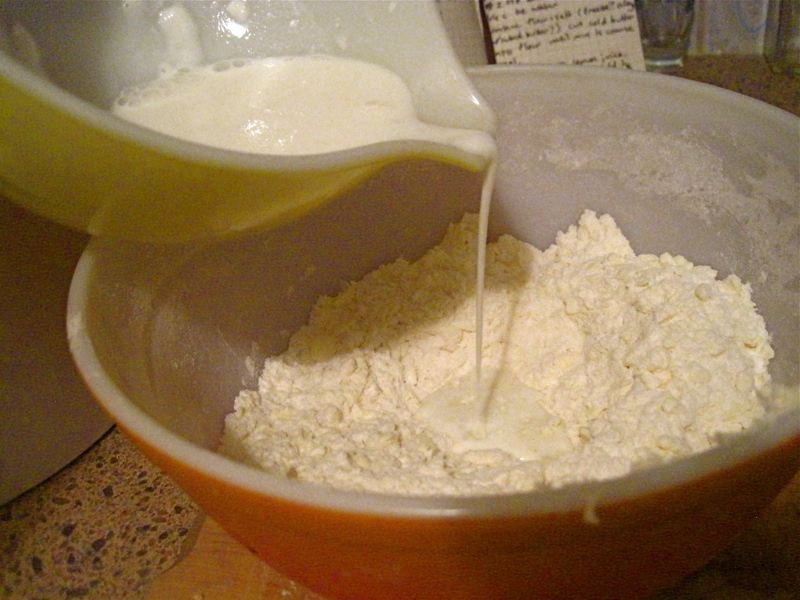 Combine flour and salt in a bowl and cut your cold butter in until mixture resembles coarse meal. 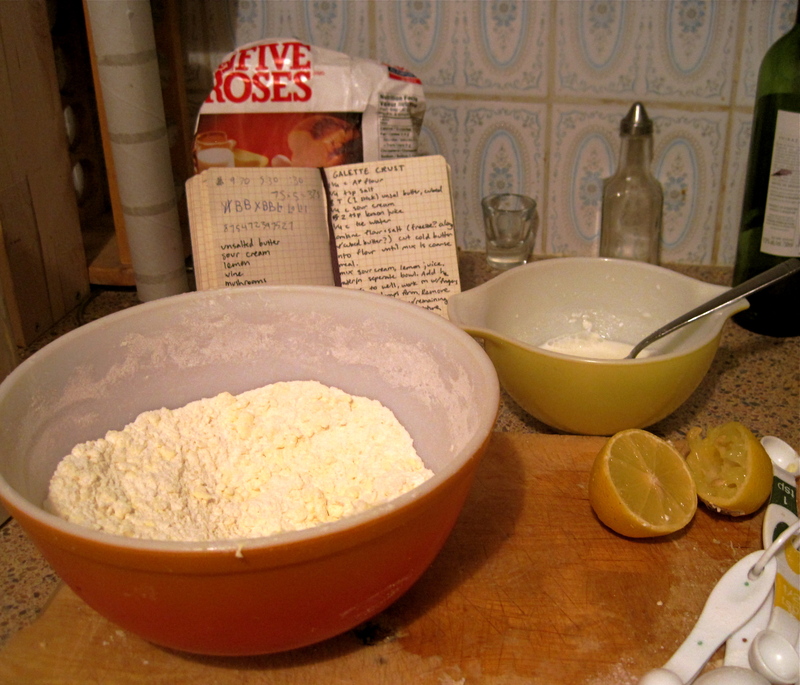 I usually use a fork or a whisk to do so (or if you’re fancy and own a pastry cutter, ball on!) in this case, for other recipes I’ll use my fingers but for these flaky crust doughs you really do want your butter to stay cold and your fingers can warm it up. Mix sour cream, lemon juice, and cold water in separate bowl. Make a well in the dry ingredients and add the wet ingredients bit by bit to the well, working in (I did use my hands for this part) until large lumps form. Try not to overwork the dough! Pack lumps into a ball, wrap with saran wrap, and chill for at least one hour. When you’re getting ready to actually make the galette, preheat the oven for 400 F.
In a large frying pan on medium heat, add a tiny bit of olive oil and the spinach. Cook, stirring, for five minutes, or until very wilted. Set aside. Wipe out pan and set back on medium heat. Add olive oil and onions. Cook on medium heat for five minutes, or until onions are soft and beginning to brown. 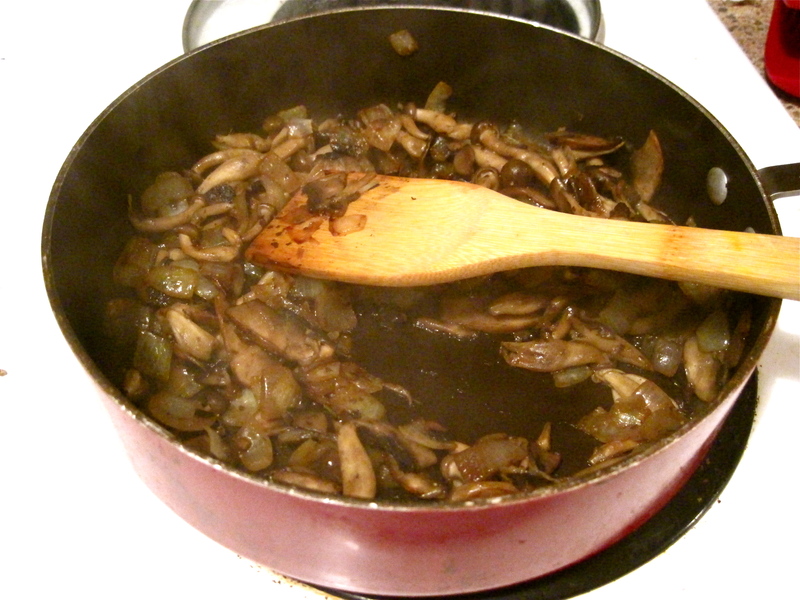 Add sugar and continue to cook, stirring occasionally, for about ten or fifteen minutes until onions are a deeper brown. 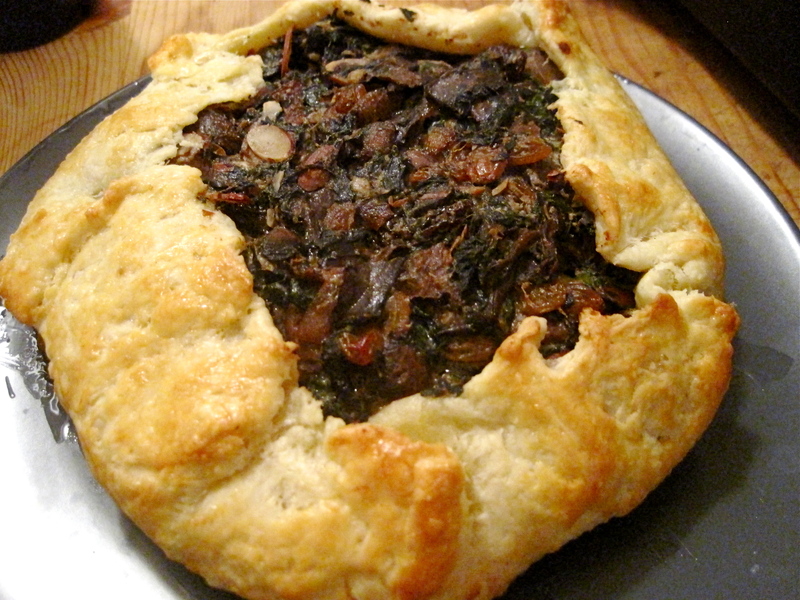 You’re basically looking to do a quick version of caramelized onions–it’s usually considered bad form to rush this process, but there’s so much else going on in this galette that I think it’s forgivable in this case. 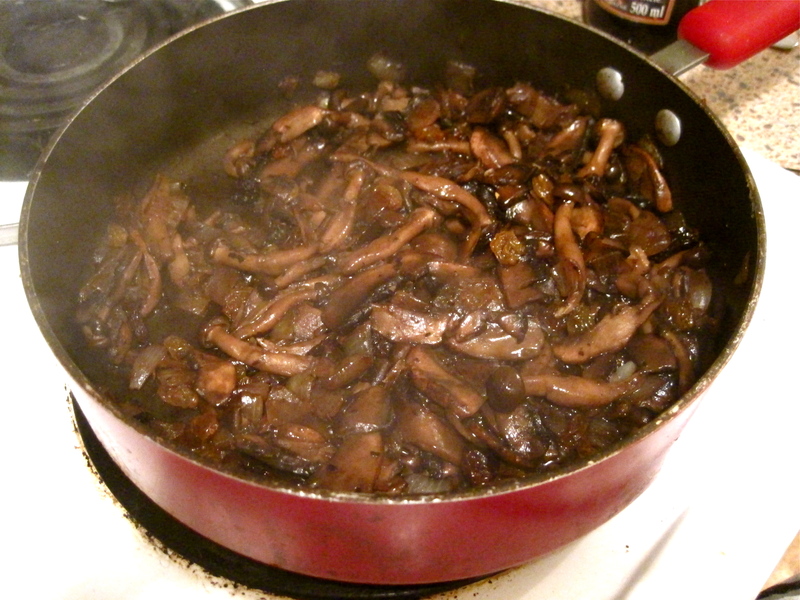 When onions are looking good, add the mushrooms, garlic, s&p, dried herbs, and more olive oil if necessary. Cook for ten minutes, or until mushrooms have lost most of their liquid. Add the vinegar and wine and cook five minutes more, or until most of the liquid is gone again. Turn the heat off under the pan. 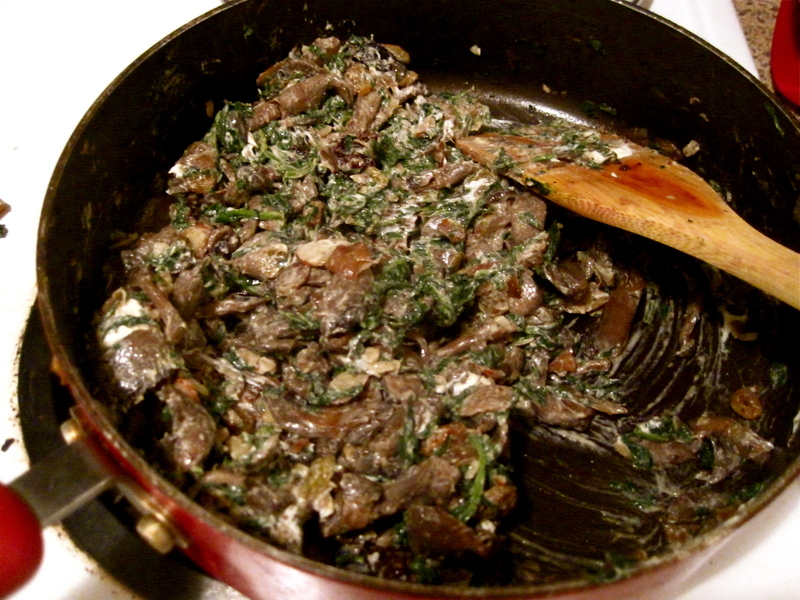 Mix the spinach, almonds, raisins, and goat cheese in with the mushrooms and onions–the residual heat from the mushrooms should melt the goat cheese enough that it resembles a creamy sauce coating the veggies. Set this pan aside and preheat the oven for 400 degrees while you assemble your galette. Roll out the galette dough on a clean floured surface, it should be about 12 inches in diameter. Transfer to a baking sheet. I rubbed a tiny bit of oil over the surface of the dough, but I’m not sure if it really made much of a difference. Pile the filling in the center of the dough round, and fold the edges over–you want the filling exposed in the middle. You can go as “rustic” or meticulous as you want in terms of pleating the folded edge of the dough–as you can see, I definitely opted for rustic. Beat your egg and use it as a wash for the crust. This is pretty much aesthetic, but I figured it helped dress up my messy crust. Bake for 30-40 minutes, or until crust is looking so golden brown and gorgeous you can’t help taking it out of the oven just to admire it. ← Hello summer! Hello BBQs! Hello world!